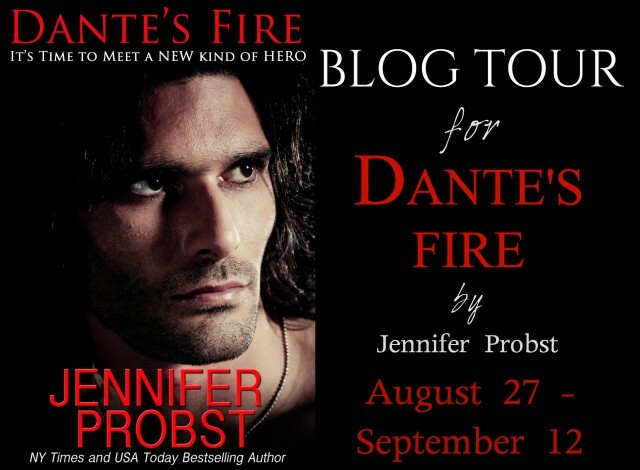 Welcome to today’s stop on the blog tour for DANTE’S FIRE! Calling all superhero fans! Dante’s Fire is the perfect book for you! I loved that Jennifer Probst went in a completely different direction than her previous contemporary novels. Dante’s Fire is very much a superhero love story–and while I didn’t love it as much as I wanted to, it was still an incredibly fun and sweet read. Dante Stark is the superhero of this story, though he doesn’t think of himself as one. He views his power to heal as a blessing and a curse. On one hand, he has the power to stop men from assaulting women, but on the other hand, he can never have a personal life. He has two identities–his real self as Dante Stark, owner of Inferno Enterprises, and his fake persona Daniel Stark, who works as the mail clerk at Inferno Enterprises. As Daniel, Dante gets to meet Selina, who works at his company. Over the years that she’s worked there, he slowly falls in love with her, but he knows he has no chance of being with her–she can never know about his alter ego, and he believes she would never fall for a man who works as a mail clerk. Selina is tough and ambitious. She’s been climbing up the corporate ladder, all the while becoming very good friends with Daniel Stark. There’s a chemistry between them, an attraction Selina can’t help but feel towards Daniel, but she’s not sure she can be with a man who doesn’t have as much ambition as she does. I admired Selina’s strength, her determination to be the best possible person she could be, despite being a product of the foster-care system. During a traumatic incident, Selina meets and is saved by Dante, which changes everything in her life. Dante, the man with superhero powers, was never supposed to meet Selina, but Dante can’t stay away from her. She only knows him as Daniel, but he’s helplessly in love with her. Now Dante has to figure out a way to get Selina to accept both of his identities, because he can’t give her up. Dante’s Fire wasn’t perfect–the plot had a few holes in it, but overall, it was a short and sweet read. Dante and Selina’s romance was romantic and full of chemistry. I’m glad Jennifer Probst decided to do a superhero story–I don’t come across one often, but this one was enjoyable and fun. I love Jennifer’s books! I’m looking forward to reading this one! This is intriguing.. supernatural, from Jennifer, can’t wait!